All shrouds are manufactured from copper sheet. The circuits structure is mirror-symmetric. Each channel has its own sieve-strains. The Center is formed by a star shaped central mass. HF sensitive ranges are protected. 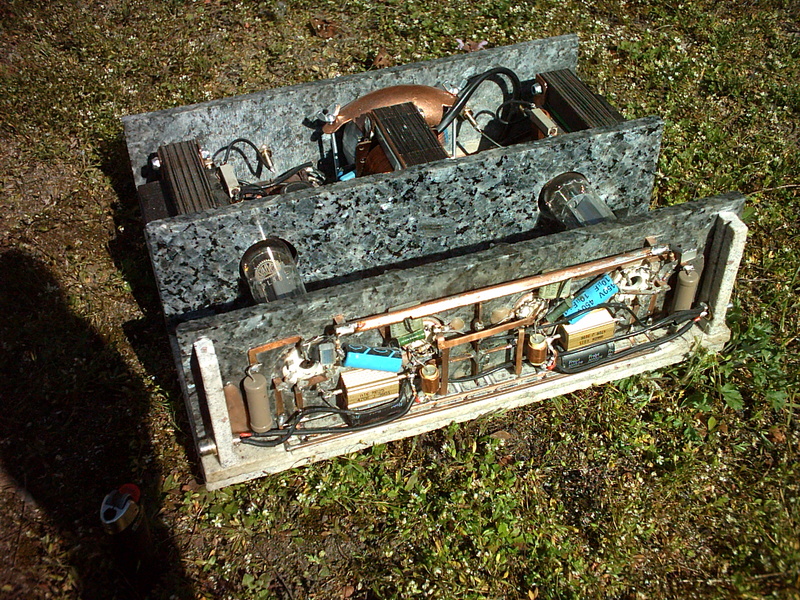 In order to allow short distances on the circuit output tubes lie horizontal (with these tubes the anode caps are at the tube point.) Output transformer- and transducer cores are far from the input area. The circuit (except for the grid 1) is made by copper sheet worked into the stone plus by soldered socket wiring (as it was done in the good old way). To prevent injury high voltage anode and G2-voltages are layed out between two base plates. They are turned flip flop, so that they are able to decouple themselves magnetically. All in all 14 000 wounds of cooper wire had to be put around the cores of the transformers and transducers as exacty as possible. The valve heaters are started gently and the anodes current is switched on delayed by a mechanism. The connection diagram is accommodated in the device. (I used a DC-current heating to avoid twisted wires.) The device fits exactly into a small ammunition crate that came in handy. Tubes: Preliminary stage: 2x PCF82, output stage: 2x PL36.